So went a recent conversation I had with a local shop owner. Placemats. 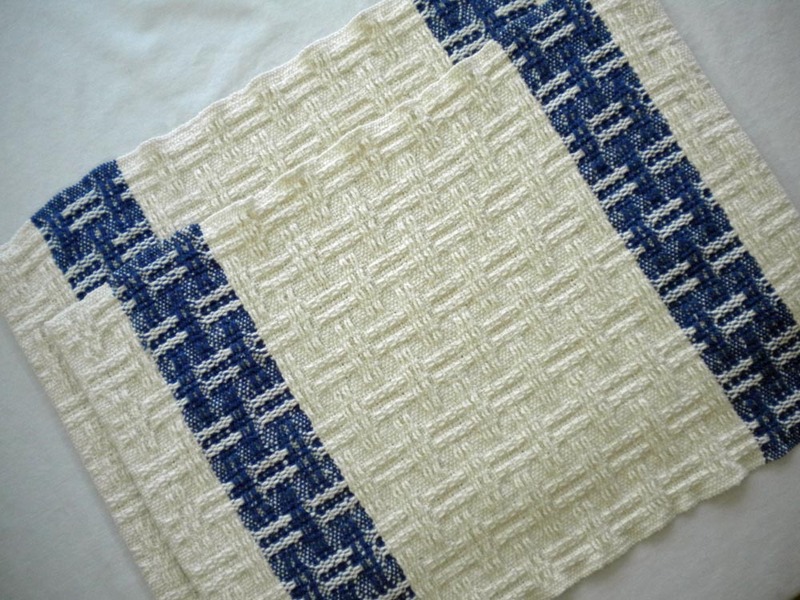 I used to weave a lot of those but over the years, I’ve shifted to towels, scarves, and other linens. I’ve woven note cards, runners, napkins, even some rugs. But not many placemats. When I got married, placemats were a popular bridal shower and wedding gift. Placemats are all-purpose. Like tablecloths, you can leave them on the table between meals as an accent. During meals, they protect the table without covering it up completely. And placemats are easy to launder. If you remove a handwoven cotton placemat from the dryer while it’s still slightly damp, you can simple smooth out the wrinkles and let it finish drying flat. Voila! Back when my Mom got married, tablecloths were the gift of choice. Every bride needed tablecloths for every day, for formal use, for covering the table between meals. Remember those all-purpose printed tablecloths from the ‘40’s and ‘50’s, the ones with flowers around the edges and a center motif? There were tablecloths for every season and they brightened the table, made a meal special and just added a nice touch to the room between meals. Over time, decorating trends and tastes changed and placemats replaced tablecloths in many kitchens and dining rooms. I have a pie cupboard full of table linens — both tablecloths and placemats (more than I actually use, but that’s another story.) The tablecloths came to me from my mother and my mother-in-law and some I received as wedding gifts. I do use them, just not every day. But every day, there are placemats on our table. I have a few favorite sets and some seasonal ones. Some are super easy to care for, others are a little more challenging (like the fake straw ones I received many years ago and still am not quite sure how best to clean them – therefore they don’t get used). There are rag placemats that were made by a women’s cooperative in Latin America, there are fine cotton placemats. There are samples of designs I’ve sold and leftovers from the ends of warps. 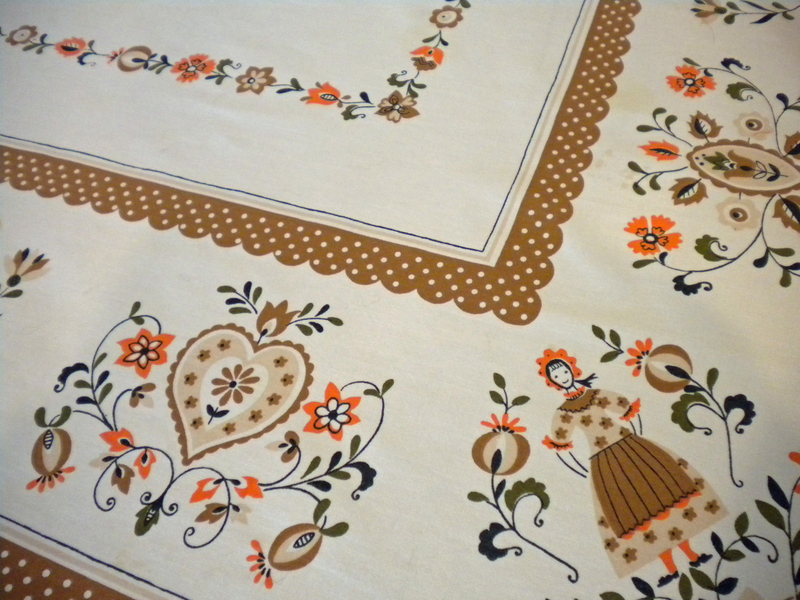 I like the old tablecloths from the ‘40’s and ‘50’s. I like the flowers and the sense of style they gave a humble kitchen. There are many still out there in estate sales and flea markets. But I like my placemats too. So I guess I’ll make some more placemats and as I’m weaving, I’ll imagine how they’ll brighten someone else’s kitchen table. Blue and white placemats! Classic! Those are very lovely and I can see why a shop owner would want to keep a lot of placemats in stock–they seem so versatile. As you may know I sell vintage linens on Etsy and find there’s a steady demand for those tablecloths from the ’40s and ’50s. Like you, I have my own stash that I bring out at different times of the year–the range of colors and styles seems endless! 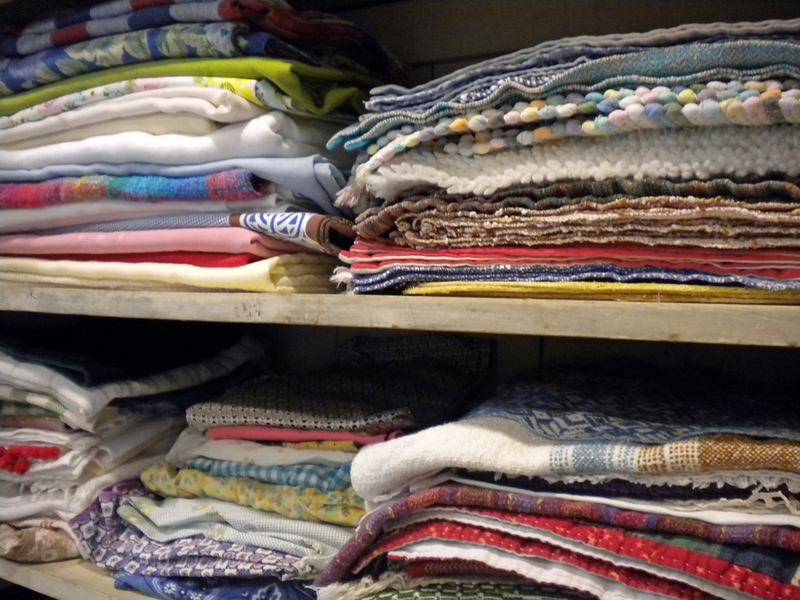 I was thinking of you when writing about my linen stash. My Mom has a lot of those tablecloths that she still faithfully puts on the kitchen table between meals.